In Fort Worth, I tried to set my first strong mark of the new season. 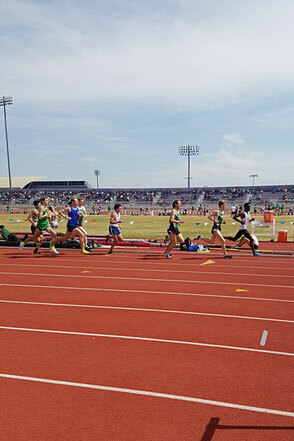 The race conditions were perfect: Barely and wind, around 80° F and some strong competitors made me set some ambitious goals for the first 1500m of the season. The start went as planed and I could position myself in 3rd position. While the leader took off in a "kamikaze-pace", the main pack ran the first lap in 63 seconds. In the following laps, I thought several times about taking the lead of the chase group but I tried to be patient and sticked to my 3rd position. With 600m to go, my team mate Mike Lowe, passed me and I went with him. With 100m to go, we were able to close the gap to the leader but he seemed to have some energy left to finish right in front of us. Our team finished strong by taking home 2nd to 5th place but the victory went to Northwestern University. Looking back, I am not really satisfied with my race. The time 3:55.58 is just 2 seconds slower than my personal best, but with a bit more courage in my race strategy the time could have been a little faster. The same time, I also have to consider my high milage, which I am currently running. The fact, that I am already faster than last year with the way higher training volume definitely shows that we are on the right track to a successful season. In 11 days, I will compete in my first 5000m of the season at the 91st Texas Relays.